Pro Shot Alpha Laser with R7 Detector and FREE Shipping to the US and Canada. High performance, rugged design. The Pro Shot™ Alpha construction laser is designed for concrete and general contractors working on large or small commercial or municipal sites. The Alpha rotary laser is built amazingly tough to handle the real-world use and abuse that happens on sites with large crews. Range 2000ft Diameter accuracy of 1/16" in 100ft. Pro Shot Alpha Rotating Laser Level from Laser Reference is equipped with Servo self leveling system. 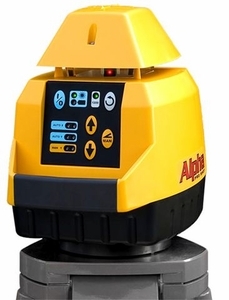 The Alpha rotating laser is a high performance, ruggedly designed instrument built withstand the demands of a construction site. The Pro Shot™ Alpha construction rotary laser is designed for concrete and general contractors, working on large commercial or municipal sites. The Alpha rotary laser is built amazingly tough to handle the real-world use and abuse that happens on sites with large crews. Electronic servo self leveling means you simply turn the laser on and it levels itself automatically. The Alpha also provides manual slope matching. Specifications: Pro Shot Alpha construction rotary laser Range 2000’ dia., 1000’ rad. (610m/305m) ± 10 arc sec. Accuracy(± 1/16" per 100') (± 1.5mm per 30m) Servo motor • ± 5 degrees Single axis, X-axis self-leveled • 8% Normally active, can be disabled 360º • 600 or 1200rpm. selectable Yes, including high speed rotation Warranty 24 Month defects coverage Power Four C-cells • 115 hrs. (alkaline) Optional Ni-Mh kit • 85 hrs. Visible 670nm CDRH and IEC Class 2 To international standard IP56 -4º F to +140º F (-20º C to +60º C) Designed to withstand a 3ft (1m) drop or 5ft (1.5m) tripod knock-over on concrete Range with R7 laser receiver . Accuracy ..................... Self leveling type • Range ..... Slope matching • Height alert, Rotation coverage • speed .... Machine control compatible ... Warranty. sealed for dust and water protection. Alpha rotary laser system include R7 receiver and carrying case.